NEW DELHI — As many as 47 people have been killed after a passenger bus skidded off a steep mountain road and plunged into a deep gorge in the northern Indian state of Uttarakhand Sunday, police said. “The bus carrying some 50 people, including a driver and a conductor, veered off the road and fell into the 200-feet deep gorge this morning. While 45 people died on the spot in the impact of the crash, two succumbed to their injuries at a hospital,” a police official said. Cops said three other critically injured passengers were undergoing treatment in the hospital. “The death toll may rise later in the day,” the official said, adding that police and a team from the state disaster response force carried out the rescue operations jointly. “Extremely saddened by the bus accident in Pauri Garhwal, Uttarakhand. My deepest condolences to the bereaved families. I pray that those injured recover at the earliest,” Modi said in a statement, tweeted by the Prime Minister’s Office. State Chief Minister Trivendra Singh Rawat has also offered his condolences to the families of the victims and announced a compensation of 200,000 rupees (3,000 U.S. dollars) for each of the dead. “If needed, the injured will be flown to Dehradun for further treatment,” he said. “So far, what we know is that the 28-seater bus was overloaded with 50 people. Anyway, a probe has been ordered into the incident,” the police official added. Accidents are common in the hilly state of Uttarakhand. 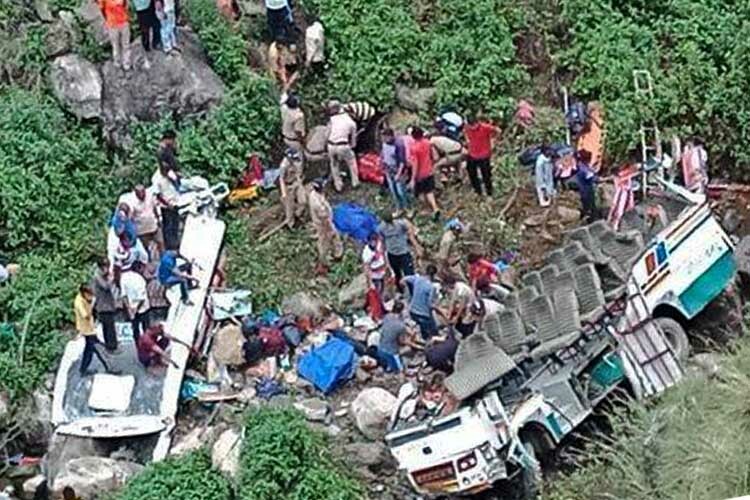 In another major accident, some 13 pilgrims were killed and 11 others injured after a private bus tumbled and fell into a gorge in Totam village in the state’s Almora district in May.